CNN speaks with Fareed Zakaria about reports over new advances by the Islamic State of Iraq and Syria. This is an edited version of the transcript. There is reportedly one base remaining in Anbar Province under Iraqi control. Talking to a general, he said it isn't so significant. You disagree. It's very significant. It’s not significant militarily, because Baghdad will hold for reasons we can talk about. What's significant here is that it tells you that the Iraqi army has collapsed, that there’s no real Iraqi army. Because those bases where people are giving up, surrendering, these are all Sunnis who don't want to fight ISIS, Sunnis who don't want to fight fellow Sunnis. What you're seeing is that if you scratch the surface of the Iraqi army, it's a bunch of sectarian militias, and the Sunnis will not fight against ISIS because they don't like the Baghdad government. They don't have that regard for a nation. It's like a sect nation. They think at this point the Iraqi government is being run by Shia. And so they in a sense don't like ISIS, but they like the Shia government in Baghdad less. So what we have to come to grips with is, this army that doesn't really exist. Billions of dollar poured into it, because it was based on the idea that there was an Iraq, that there was a nation that there would be a national army for. Maybe we need a different strategy, which is to stand up sectarian militias, Shia militias, Sunni militias. They already exist. And the Kurds have their Peshmerga, that model. Send them into fight in their areas, not in other areas where they would be regarded as a foreign army. That's giving up on a lot, but if you look at events on the ground, that's what reality is telling us. The reality with regard to Turkey – many are wondering what their role would be moving forward. We now know. We watched the parliamentary vote, that Turkey is now saying to the U.S. OK, you can use our country as this launch pad to bring your troops in and to fire rockets and whatnot. How significant is that move? Do you think that could be the next step toward maybe some ground troops from Turkey? Turkey is absolutely crucial, because they're the one serious army in the region that borders the ISIS forces that has the capacity and that has the determination and that has the interests at stake. Turkey has put its head in the sand for so long, trying to believe they don't need to get involved, and they have allowed again their petty issues to overwhelm them. Is this them pulling their head out of the sand just a little bit? And they can't put all that aside and just fight the terrorists, bottom line? And they can't put that aside because they don't feel that they're threatened. They feel that ISIS will stop at their border. And they're probably wrong. And so what you're seeing is everybody wants the United States to sweep in like a knight in shining armor. Fix it for them so they can all free-ride on the United States. And I think one of the things we have to recognize is if the United States stays back and forces some of these governments in, they're going to get involved. They are threatened. This is their region. We're 6,000 miles away. But, of course, they would much rather the United States come in and we have got all the firepower and Washington has all the firepower. Who wants to fight if the largest military in the history of the world is willing to do it for you? Final question, Baghdad – how vulnerable? Do you worry about that? I don't worry about it a lot, because the truth is that because Baghdad is now the Shia capital of Iraq, there are lots of Shia militias. The army is Shia, they will fight until the end. And, remember, the Iraqi army, even in its currently reduced state, it is several hundred thousand. ISIS may have 10,000 or 15,000 people. They are outnumbered 10 or 15 to one. The weapons that the Iraqi army has are much better. And these guys have the will to fight because they want to preserve Shia control of Baghdad. 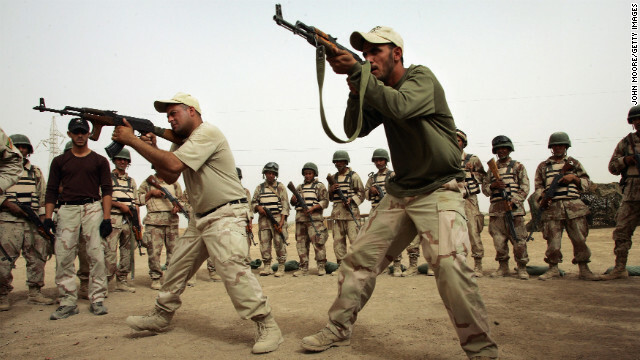 « Previous entryWhat role can the Peshmerga play in fighting ISIS? Published on Sep 1, 2013!!! September 1, 2013 – (FULL INTERVIEW) – John Kerry appeared on Fox News Sunday and told host Chris Wallace that President Barack Obama's decision to seek congressional approval for military intervention in Syria would reinforce such action. "It will allow us to do even more coordinating with our friends and allies, do more planning, and frankly be for more effective," Kerry said. "I think this is a smart decision by the President, a courageous decision. He is not trying to create an imperial presidency, he's trying to respect the process by which we are strongest in this country." Wallace noted that the rebels may be under a slightly more urgent timetable than the U.S., and referenced a newspaper in Damascus had portrayed Obama as "flinching." "Haven't you handed Syria and Iran at least a temporary victory?" Wallace asked. "I don't believe so at all," Kerry said. "That is in the hands of the Congress." Kerry did not believe Congress would decline military action. "I don't think that's going to happen," Kerry said. "I can't contemplate that the Congress would turn its back on all that responsibility, and grant impunity to a ruthless dictator to continue to gas his people. Those are the stakes." Kerry also affirmed that Obama could act without Congress, including before Congress reconvenes on September 9th. "If the Assad regime were to be foolish enough to attack yet again in the meantime, of course the President of the United States knows he has the power to do this, and I assume he would move very, very rapidly," Kerry said. "But he feels were are stronger in getting the United States as a whole to gel around this policy, to understand it better, and to know what the strategy is and why the United States needs to do this." The Secretary of State pushed back against Wallace when the host asked why the President was waiting ten days until Congress returned from vacation. "I'm amazed that you would argue against the Congress of the United States weighing in," Kerry replied. "This strike can have impact when it needs to, with the support of the Congress of the United States." Why USA inform Assad and Iran Islamic regime before any air strike? Iran regime released many Afghani drug dealers from the Iran prisons and after giving them money, send them to the Syria to fight against the Syria free army!! If the guys you're fighting perfectly understand you and your world (and your predictable knee-jerk reactions) and you understand next to nothing about them and their world, you face an inevitable fall, no matter your force. We froze out the Baathists, supported a corrupt sectarian government, failed to anticipate Arab Spring sentiments and "trained" a leaderless military. What could go wrong? Maybe we should reconsider playing God in that part of the world.